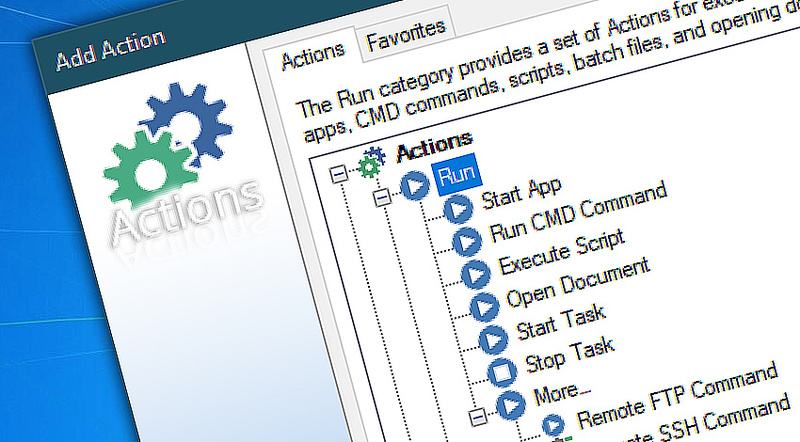 The Run category features multiple Actions like Start Program / Application, Run DOS / Cmd command, Open Document and Execute Script. These Actions allow taking automation beyond the built-in capabilities of Automation Workshop Free Edition by adding options of process streamlining and integration with external applications, commands and scripts. While Automation Workshop Free Edition is providing a solid ground for IT process automation, often there is a need to add specific external processes to the workflow. Successful integration of application, command or script execution not only presumes successful launch of the process, but also control of its outcome. Start Program / Application can start any Windows program or application (easy selection from Start menu). The application can be started in its own or any other folder with specified arguments being passed to it. After an application is started, Automation Workshop can either continue immediately with parallel processes or wait until the application finishes and analyze its exit codes to decide whether to continue with further operations or stop the Task. Run DOS / Cmd Command can run Windows prompt commands and start batch files. The Action can be set to retrieve errorlevel value which tells whether the command or batch file execution was successful or experienced some error. The Task can use this information to alternate its operations. Open Document automatically opens the file in associated application. The Action can request the program to perform some operation other than default, e.g. Edit, Print. Execute Script supports a variety of script formats. Take advantage of JScripts, VBScripts and PowerShell script support to integrate your existing scripts into automated workflows, thus saving time on redesigning IT process automation or supplementing Automation Workshop functionality with custom options. Start Task automatically starts one or multiple Tasks. These Tasks need to be designed either for manual run or to expect execution from Start Task action. Start Task action can not replace Trigger provided data unless specifically configured to do so. Stop Task automatically tries to stop the running Task and assigns its completion status such as normal termination, warning or error. Can show optional error message. Manual Run is yet another way to successfully implement Tasks for purposes of batch file replacement. While not an Action itself, it is a method of running Tasks, namely, upon user request. No automation Triggers are required for Tasks that are manually executed, and user has direct control over the process · More on Manual run. Start Task · start a particular Task. Stop Task · stop a running Task.